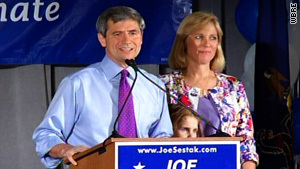 Rep. Joe Sestak defeated long-time D.C. figure Sen. Arlen Specter in Tuesday's Democratic Senate primary. NEW: Specter to Dem who beat him: "You have my support for the general election"
Washington (CNN) -- Sen. Arlen Specter is on his way out of office after serving 30 years on Capitol Hill, losing Tuesday in the Democratic primary for his Senate seat to Rep. Joe Sestak. "Congratulations, Congressman Sestak," Specter tweeted shortly a brief public speech. "You have my support for the general election." Sestak called his victory "a win for the people, over the establishment, over the status quo, even over Washington, D.C."
"Some want to go back to the failed policies of George Bush," he said. "Letting Wall Street do whatever it wants or just say no to progress. On the other hand, I think we know we're in pretty tough times, but we know that we can go forward, we know that we must go forward. But to do so we need a public servant, not a politician." He then complimented Specter and his long public service. 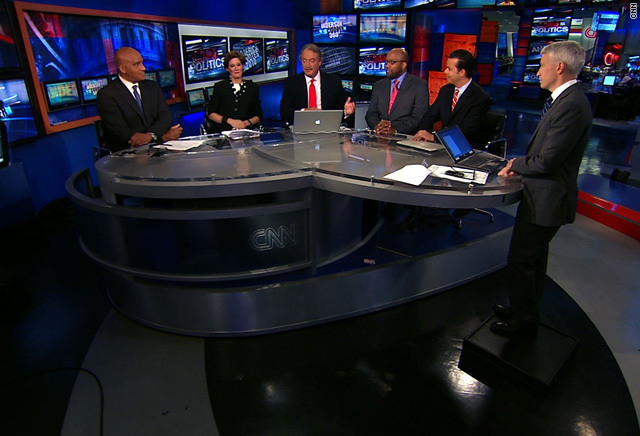 "We disagreed about a number of things, but we're Americans," he said. "But he has done good things for Pennsylvania." In his public remarks, Specter thanked his family and campaign staff. "It's been a great privilege to serve the people of Pennsylvania," he said. "And it's been a great privilege to be in the United States Senate, and I'll be working very, very hard for the people of the commonwealth in the coming months. Thank you all." Sestak, a retired Navy admiral, launched a longshot bid to dethrone one of Pennsylvania's most powerful political figures in recent time. But public polling shows that Sestak surged as Specter fell. The winds of anti-incumbency blew into Pennsylvania over the past few weeks, and Specter watched his once-commanding lead over Sestak disappear. Why the weather analogy? Because there hasn't been a member of Congress who has had a more stormy 12 months on Capitol Hill than Specter, the gruff and unpredictable Pennsylvania Republican-turned-Democrat who is known in Washington and beyond as "Snarlin' Arlen." Specter is 80, but for Democrats in 2009 he was the new 60, the parliamentary crowbar Democrats needed to help muscle President Obama's policies past Republican opposition in the Senate. Specter's decision to abandon the GOP in April 2009 effectively gave Democrats that 60th vote. Democrats would have to wait until the contested Minnesota Senate race was resolved in early summer, but that was more of a formality. Democrat Al Franken's victory over GOP Sen. Norm Coleman in Minnesota handed Democrats the 59th vote -- it was Specter's defection that made the GOP by and large powerless. With Specter's loss, expect a major storyline Wednesday to be whether Obama has lost his golden political touch. His track record of late has not been so good. Despite the president's 11th-hour visit to Massachusetts in January, Attorney General Martha Coakley lost the special election to fill the late Sen. Edward Kennedy's seat. Another trip a few months earlier to try to save New Jersey Gov. Jon Corzine also failed. And while Obama resisted heading to Pennsylvania on a late rescue mission for Specter, he was still tied to this newly minted Democrat, and Republicans were itching to highlight it.